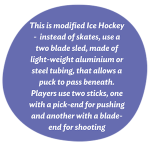 Para-Ice Hockey is so much more than an adrenaline-filled sport – for some players, it is a way of life. Sarah Sullivan has been an avid Para Ice Hockey player for a year, experiencing the exhilaration of the sport first hand. Although a self-confessed “non-sporty individual”, Sarah has immersed herself into everything the sport has to offer. The interest and the fun came as a surprise to her, after participating in a come and try session. Sarah went to her first come and try session in December 2017, and from there on there was no stopping her. The past year has been chock-a-block for Sarah, representing Australia in the Women’s Para Ice Hockey World Cup in Ostrava. As the only Australian representative there, the rest of the team was made of players from elite and emerging nations. For Sarah, this reiterated the kind of support and positive environment that para-ice hockey embodied. During the world cup, players from emerging nations participated in an intensive development camp, with best coaches and mentors. This helped Sarah gain knowledge of the sport and get an “experience of the lifetime”. 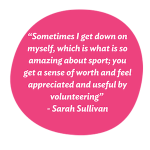 Participating in the sport has helped Sarah mentally, helping her break various barriers, make new friends, and share similar experiences.